Conny Ornell, captain SAS airlines, Mary Considine, deputy CEO, Shannon Group, and Alan Sparling, MD of ASM Ireland, at the commencement of Scandinavian Airlines' twice weekly service to Shannon from Stockholm. 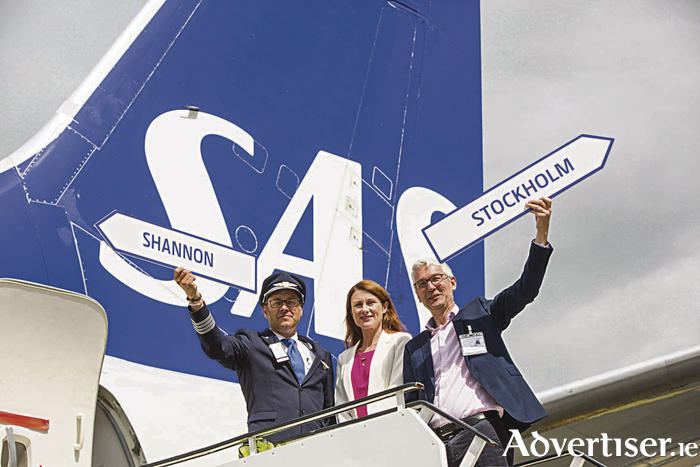 Tourism providers along the Wild Atlantic Way got another boost this week with the commencement by Scandinavian Airlines (SAS ) of a twice weekly service between Shannon and Stockholm. The service is the first between Shannon and Sweden’s busiest airport, Stockholm Arlanda Airport, and the first between Shannon and Sweden in some 12 years. It will operate for August and September, concluding on October 7, and its addition to the schedule is further affirmation of the success of the Wild Atlantic Way and Shannon as the key gateway airport to it. Mary Considine, deputy CEO, Shannon Group, said: “This is the fourth new destination added to our schedule this year, adding to two new transatlantic and a Frankfurt service. The common denominator for all these is the Wild Atlantic Way, which has become one of the biggest success stories in tourism globally this decade. Andrew Murphy, managing director of Shannon Airport, added: “This is a further boost for tourism in this region as it gives the Nordic market, where there is a growing demand for the Irish tourism product. Visitors from there typically look for vibrant night life, top quality food, traditional music, golf, adventure, etc. This is exactly the type of offering on the Wild Atlantic Way and now, at least, we can fly visitors from part of Europe directly in here rather than them having to travel across the country when they land in Ireland.